Even though I view my human as a valued assistant and partner, I know that some of you kitties out there have a more parental type relationship with yours. If that’s you and your human is female, you probably want to do something nice for her for Mothers Day! I imagine you’ll leave the usual hairball on the floor right by her slipper (or, if you have a good aim, in it), but I’m sure there are other things she’d like too — maybe even better than a dead cockroach or lizard! I’ve got a few paw-picked suggestions below. Most of them are reasonably priced so that you don’t have to dip too far into your treat fund to buy them. The links are all affiliate links, which means I get a small commission for any sales. 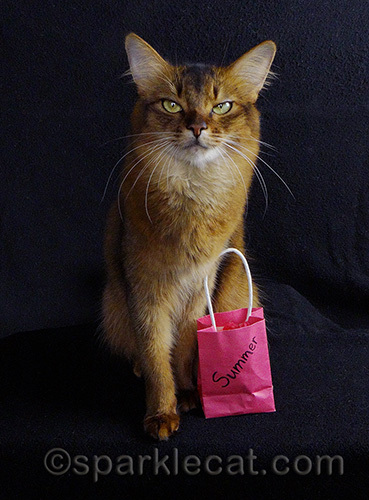 That way, when Administrative Assistants Day comes up, I’ll have some money to buy my human something nice. 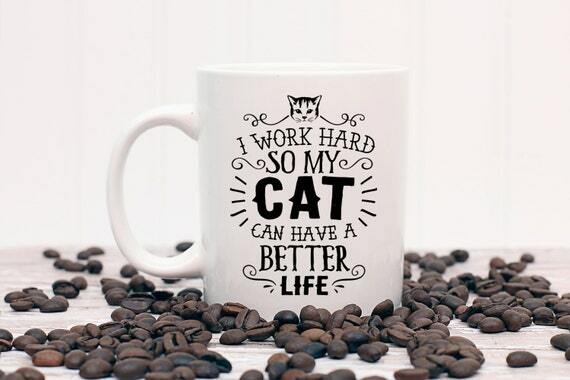 I’m sure that most humans with cats will identify with this cute mug from The Crafty Engineer. It shows that you acknowledge and (usually) appreciate all that effort. This extra-long tee from So Pink UK is fun, versatile and really comfy! Made from 100% combed and ringspun cotton and ships from the UK. What a sweetly sophisticated handbag! Triple T Studios features awesome accessories with style and class, and this 14″W x 10″H x 5.5″D handbag is one of their most beautiful items yet. It’s available for pre-order and expected to ship in May. Your human should be one of the first to have this lovely item. 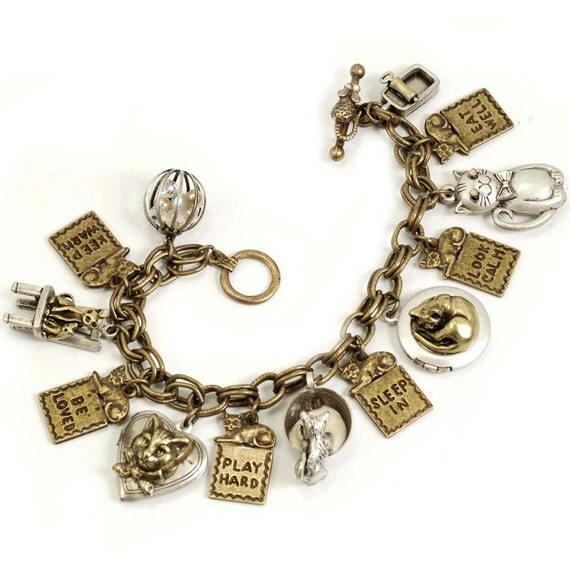 Your human will treasure this adorable charm bracelet, made from pewter, Swarovski crystal and bead accents, and kitty wisdom! From Shelley Cooper Jewelry, it includes a locket just waiting for a photo of you! Here is more kitty wisdom in bracelet form, this time from Triple T Studios. The simple bangle is made of stainless steel and is nickel and lead free. 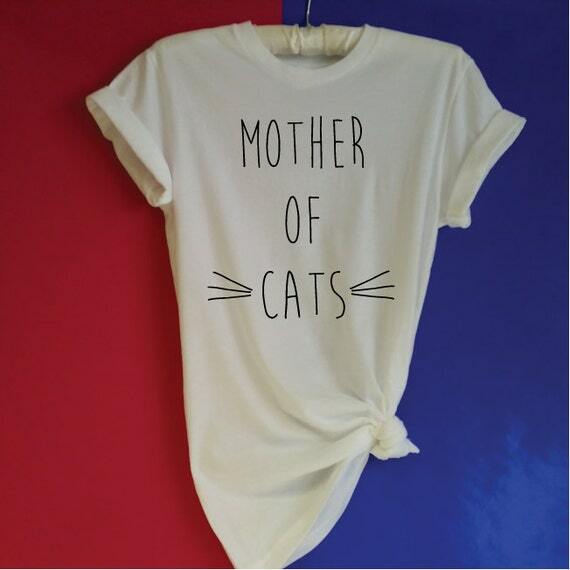 You human won’t go wrong wearing sayings such as “Purr,” “Live in the Moment,” and “Trust Your Instincts” — in fact, she could wear more than one! These graceful, lightweight braceless are one size fits most. Aren’t these pewter ring stands cute? I know my human is always taking off her ring to wash her hands or clean the litter box — wouldn’t it be nice if yours had somewhere to put hers? They come from Not A Jewelry Box LTD, which specializes in creative jewelry storage. 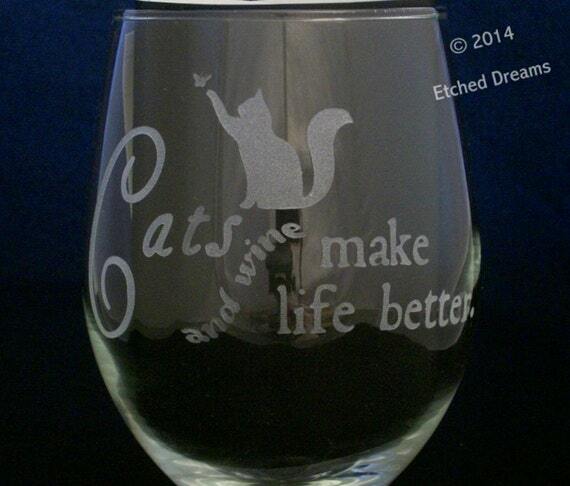 I know a lot of humans out there who would really appreciate these etched wine glasses from Etched Dreams. Is yours one of them? This is a set of two 20-oz. glasses… drink up! Your human will never misplace her glasses when she has this sleek chrome case for them! 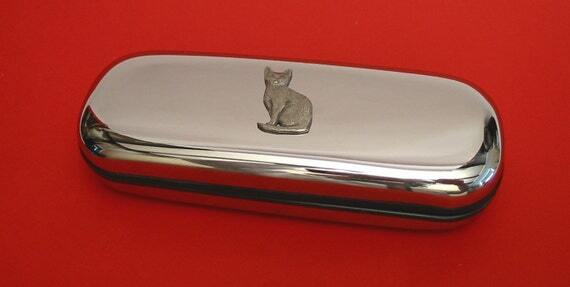 Made by Thimbles n Object Dart, it features a pewter kitty on the top. A really nice design! Here is something totally fun: feline inspired faux nails with glitter infusion. They’re perfect for your human to wear to the next cat rescue fundraiser. 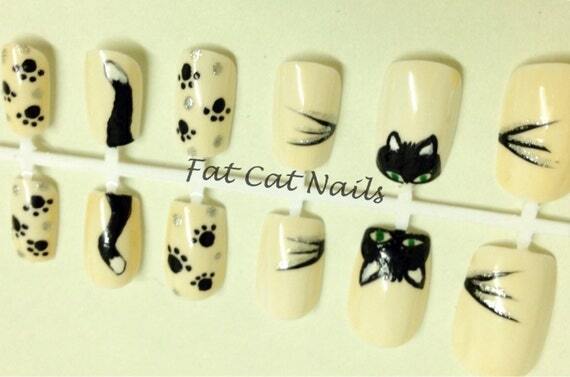 Fat Cat Nails has lots of other cool nail designs too… not all of them kitty inspired! I hope you enjoyed my picks! we’ll have to hijack our mom’s plastic monies. thanks for these gift ideas, Summer! 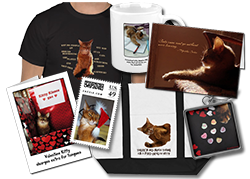 Wow, you found a lot of great gift ideas for cat moms. Faraday: *raises paw* Wait…what’s wrong with the hairball option again? I thought fiber was good for humans…. Those are great, Summer! We especially like the feline philosophy bracelets! Is yous getting them ALL for your human? Mes is still trying to decide between yakking in Mommy’s shoes or in the middle of the bed. Those are great items. I love that purse. Pawesome picks, Summer. We’re gonna get Mommy’s credit card and go shopping! Those are all lovely gift ideas. My mum particularly likes the wine glasses. Those are fabulous ideas Sparkle! 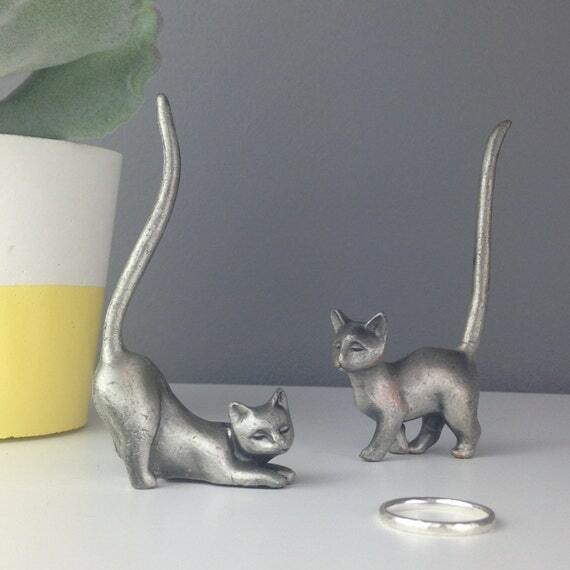 I love the Cat Ring Holders! Like a “Happy Cat,” these kitties have their tails high up in the air! What GREAT suggestions Summer! You took all the agony out of shopping for me! Oh sweetie, M is going nuts here over your picks. She wants one of everything, except maybe the nails since she’s an old lady. You have great taste Summer. Those are fantastic gift choices. Mom especially likes the mug – she says it makes the work week worthwhile, knowing it’s us she is providing for. Thanks a lot Summer. Our mom loves almost all of them. She’s going to check on the link now. Pffft, there goes our treat fund for the month! “Most of them are reasonably priced so that you donâ€™t have to dip too far into your treat fund to buy them.” I LOVE THAT!!! Great choices, Summer! Great picks! I think I’ll get the nails for mom! That way she can really scratch my head!! Those are amazing! My mum has one of those ring holders. Those are great ideas Summer! Our mommy likes that Purr bracelet. Beautiful gifts. Love the purse. You have found some winners, Summer! We had fun looking at them. Those are all excellent gifts – I’d like the glasses case – Can you let BB and Miss Frankie know? I know someone those wine glasses would be perfect for! Lots of cute stuff here, Summer. You’ve chosen some lovely items for us to look at Summer and we’re going to ‘borrow’ Mum’s purse so she can have the pleasure of paying for the one she likes best! We think the mom would love any of these gifts, Summer. Thanks for the list. I’m getting the peep nip plants, I think. I mean, who wouldn’t want nip? PS. On the other paw, Peep #1 says she likes your suggestions better than nip. Hmmm… Methinks me had best make an appointment with the vet for the peep. Methinks she might be delusional or something. MOUSES! Those are all great looking gifts. We like the wine glasses. That would make a great present for someone. Those are some darn pretty goodies sweet Summer! Mum am SO getting that handbag!!!!! 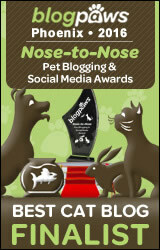 Look out for it at Blogpaws!! Those are really cool, Summer! Have a great weekend! Those are all super gift ideas Summer! <3 wanted to Pin all of them but there is not an option. The default image is summer.